The Concours d’Elegance Classic Car Show, held in November of each year in the city of Winter Park is Orlando’s best overall car show. The 2014 event will be held on Sunday, November 16th, 2014 from 10 AM – 5 PM with the awards ceremony at 3 PM. The Concours d’Elegance features over 120 exotic classic cars spanning over 6 blocks along Park Avenue in Central Park. 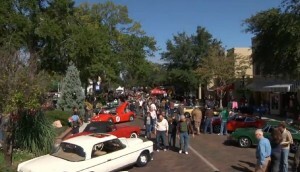 Over 85,000 car enthusiasts attended the 2013 event and the event continues to grow. Now in it’s 13th year, the Concours d’Elegance has featured such cars as Aston Martin, Jaguar, Austin Healey, Mercedes Benz, MG, Ferrari, Maserati, Rolls-Royce, Bentley, Morgan, Triumph, Porsche, Lamborghini, Lotus, and Volvo. Special exhibits have consisted of original Hot Rods, American Muscle Cars, Classic Corvettes, American Classics, Audi and BMW.